Fake Tattoo To-Do List | OhGizmo! By Andrew Liszewski on 01/29/08 • Leave a comment! I have a nasty habit of using my hands instead of a scrap piece of paper for jotting down reminders and to-do lists and while I’ve seen people getting blank to-do list tattoos on their hands and arms before, I don’t think I’ll be following that particular trend anytime soon. 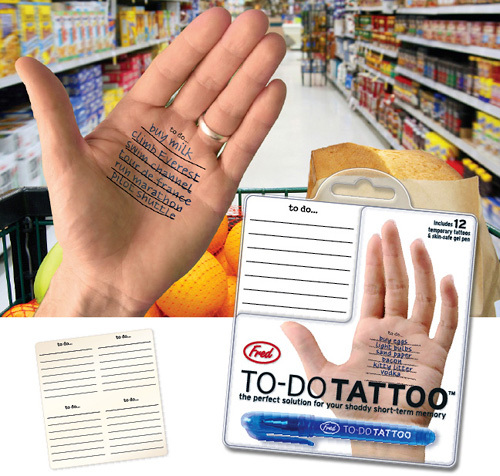 As an alternative here’s a kit that includes 12 temporary to-do list tattoos you can place anywhere on your body. That way if you happen to end up like that guy in Memento with a particularly short-term memory you can at least keep things neat and organized. The kit also includes a skin-safe ink gel pen that easily washes off, but I have no idea how long each temporary tattoo will last. ← Make Your Own NintendoDS Games And Save!